Aerospace engineering students Robert Fievisohn and Sylvie DeLaHunt win the 2016 Graduate Student Research Competition. 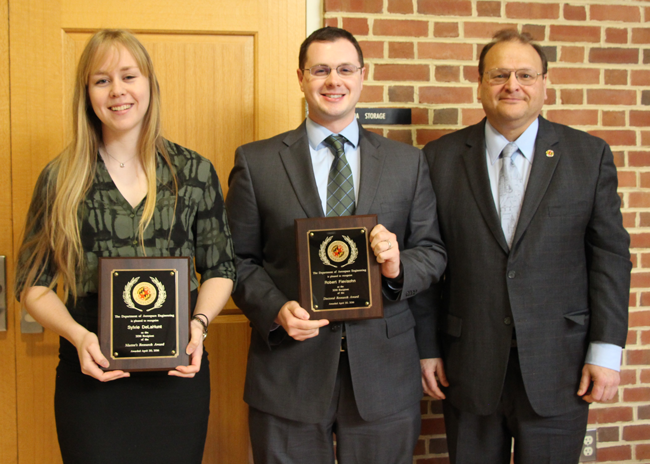 The department recognized both Fievisohn and DeLaHunt during the department at the Alfred Gessow Memorial Lecture and Luncheon held on April 20th. The department competition is part of the nomination process for the Clark School of Engineering's Dean’s Research Award Competition that was held on May 7th. In the Dean’s competition, Fievisohn won third place for his paper “Steady-State Analysis of Rotating Detonation Engine Flowfields with the Method of Characteristic.” Fievisohn joined the department in 2013 as an advisee of Dr. Ken Yu. He received his undergraduate degree at Clarkson University in upstate New York in 2008 with a dual degree in Aeronautical Engineering and Applied Mathematics and Statistics. While at Clarkson, he participated in Air Force ROTC and upon graduation became a 2nd Lieutenant in the Air Force. His first assignment was getting a master's degree at the Air Force Institute of Technology in Aeronautical Engineering at Wright-Patterson AFB. Afterwards, he was assigned to the Air Force Research Laboratory at Wright-Patterson. DeLaHunt won second-place in the Master’s category for her paper “Variable Recruitment of Miniature Pneumatic Artificial Muscles and Space Qualified Pneumatic Artificial Muscles.” She is a second year master’s student specializing in flight dynamics and control. Her master’s thesis, “Variable Recruitment in Bundles of Pneumatic Artificial Muscles and Space Qualified Pneumatic Artificial Muscles,” was completed under the guidance of Dr. Norman Wereley and with the support of a National Science Foundation Graduate Research Fellowship. DeLaHunt is a founding member of UMD's Women in Aeronautics and Astronautics (WIAA), an organization created to foster community by offering opportunities for networking, professional and technical development and outreach to help attract and retain more women in aerospace engineering. In addition, she has published an op-ed in the Baltimore Sun on "Encouraging Female Engineers” and received an honorable mention in The American Society for Engineering Education's (ASEE) Year of Action on Diversity Student Essay Contest. She was selected as one of “Tomorrow's Engineering Leaders: The 20 Twenties" by Penton's Aviation Week Network. This summer, DeLaHunt will begin working full-time at the Johns Hopkins University Applied Physics Laboratory in Laurel, Md.